iLuminate the Worldwide Visual Hit Premiered in Riyadh on Wednesday, 28th September. Wednesday, 28th September saw the electrifying Premier Launch of iLuminate™, a New York based group specializing in the field of entertainment technology. The touring company performed in the conference hall of Princess Noura Abdul Rahman University for Women to an audience of political and media elite, including noted presenter, Ibrahim Basha. 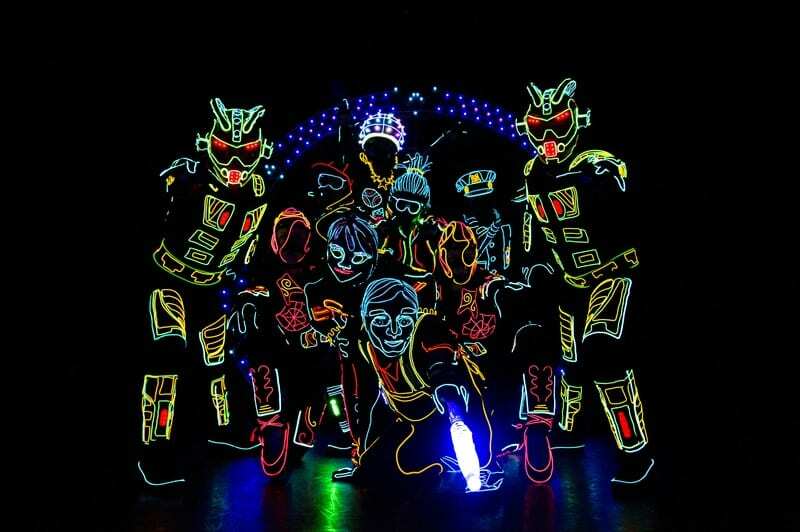 iLuminate™, the Off-Broadway smash spectacle is a visual feast. They wowed the USA with their groundbreaking light suits and innovative dance moves on NBC’s “America’s Got Talent,” where the dance-in-the-dark LED sensation was selected as one of the hit show’s top finalists after judge Piers Morgan called them “The Best New Act in America!” The innovative performers entertained the young and mature alike, with contemporary music blended with choreography as the LED suits were used to create visual illusions. The highly organised affair was brought to life to an expressive and appreciative audience. Local businesses Munch Bakery, Fauchon, Krispy Kreme and Ala Khafeef provided food and beverages at the venue. Miral Kotb, an entrepreneur, dancer, choreographer, and software engineer combined her passion for dance and computers in 2009 to create iLuminate™. The concept emerged while Miral was developing iPhone applications. She had a vision of dancers wearing costumes that illuminated wirelessly to compliment the music and choreography; wireless technology that could be controlled from the palm of one’s hand. She pursued her idea with help from some of the best hardware and software engineers in the business to create this innovative production. Following the establishment of the General Authority for Entertainment, in May, the invigoration of the cultural scene in the kingdom is a major component of vision 2030. Vision 2030 is determined to diversify the capabilities of the Saudi Economy away from its currently high dependency on oil. Productions of this nature will help the entertainment industry, which in turn should attract tourism to the region. The show is scheduled to continue its run in Riyadh before moving onto Jeddah. In Riyadh the show will continue on until Saturday, October 8th, and then will move on to the Red Sea city of Jeddah, where it will be held in the locked hall in King Abdullah Sports City from Monday, October 12th to Thursday, October 22nd.